Though every political party considers the slum dwellers of Serilingampally a potential vote bank, there has been little change in their lives irrespective of the party in power. An area in the backyard of the Hitec Kamaan in Telangana’s global city is secluded from the glitz and glamour that the adjacent localities of the tech hub promise. This is where a large number of ragpickers from Hyderabad live. 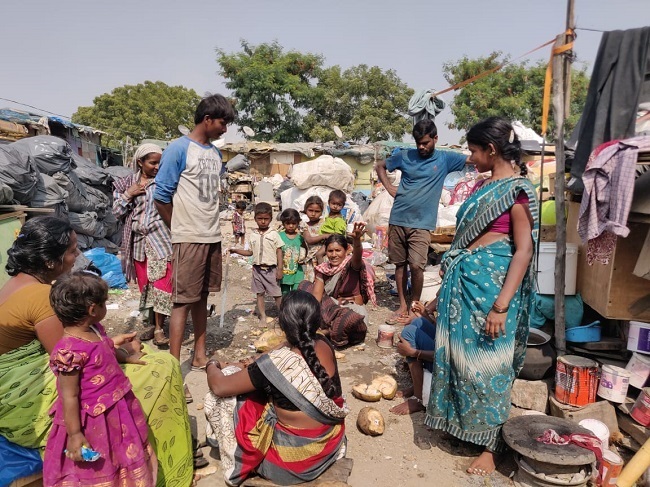 Out of the 300 people who live in the slum – migrants from Andhra Pradesh’s Kurnool district – around 100 people own a voter ID. They do not have a ration card or an Aadhaar card but this group of people is considered a potential vote bank by all political parties contesting from the constituency – Serilingampally. The 100-odd families in the slum live in tiny shacks with metal roofs which are built around the heaps of garbage they collect every day. “Garbage doesn’t disgust us anymore. What churns your stomach and makes you pull a handkerchief over your nose, is our daily bread,” Venkatesh, one of the slum dwellers, says. This election season too, every political party has done their best in promising the community better livelihood options and promising concrete houses to live. While TRS has again fielded Arekapudi Gandhi, the sitting MLA from the constituency, the People’s Front has given the election ticket to industrialist Anand Prasad. BJP’s candidate Yoganand has signed on a bond paper assuring the voters of Serilingampally to solve the civic issues in the constituency if elected to power. Venkatesh says he doesn’t own a ration card but has a voter ID and would cast his vote this time too. “I don’t remember whom I voted for the last time. I think it was Arekapudi Gandhi. I haven’t decided for whom I would vote, but I am sure I will cast my vote this time too,” Venkatesh says. Venkatesh is one among the many in the slum who has been living in Hyderabad for the past 10 years. 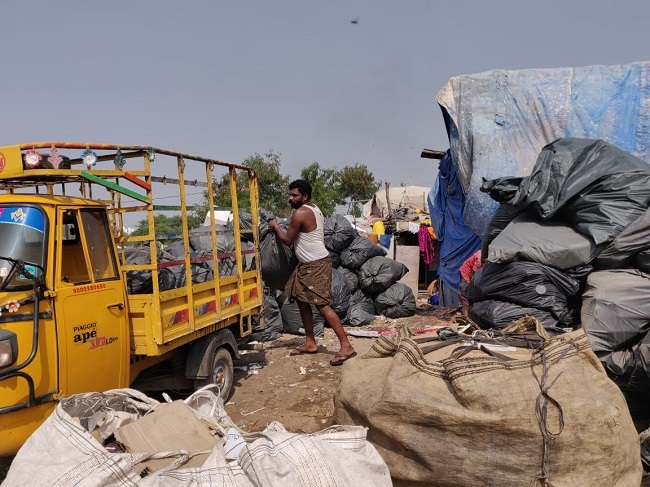 Long spells of drought and crop failure in Kurnool had forced him to migrate to Hyderabad and ever since, he has been collecting garbage from houses in and around the city. “Our children study in Kurnool and stay with their grandparents. It’s too expensive to afford education in this city. I have huge debts back in Kurnool. We keep going back but mostly live in Hyderabad because our source of income lies here,” Venkatesh says. One shouldn’t mistake Venkatesh’s political consciousness as one that stems from eagerness to become a beneficiary of the government’s policies and schemes. In fact, the community says, irrespective of the change of power at the state or centre, their lives continue to be the same. “Our homes become a complete mess every rainy season. Water mixed with garbage enters homes and the stink makes it unbearable to breathe. Sanitation inspectors visit and promise to clean up the place during every monsoon, but the promises are just like a line drawn over water,” Venkatesh says. The slum doesn’t have a washroom. While men and children bathe and wash in the open, a small enclosure covered with tarpaulins has been made for the women. Children play in the garbage on grounds that are strewn with faeces, flies and dry waste. “Apart from political candidates who come here during election campaigns, no one ever visits us. In fact, I am surprised you have come down to talk to us. Whenever we have visited the GHMC officials with our grievances, they shoo us away telling us that we stink. We collect garbage for the city, why wouldn’t we stink?” Venkatesh asks. The plot of land that the community lives on is privately owned. Ravi Kumar, a young man at the slum, says that every month, a man comes to collect chanda from each house in the slum. But he’s quick to change his words and tells they only pay the monthly electricity bills. “Few houses have electricity connection but water supply is still a distant dream. We buy water cans for drinking and now we have dug a borewell for other uses such as bathing and washing. Once the case against the land gets cleared, we might get kicked out from here too,” one of the women in the slum says. 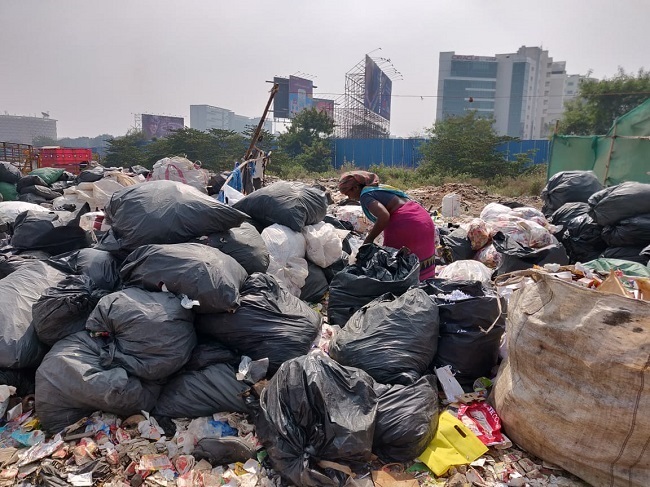 The women living in the slum collect scrap from the dumped garbage and sell it to Lingamma, another woman in the slum, who in turn sells it to scrap dealers, who outsource them to factories. “Our men earn some money from door-to-door garbage collection every month and for loading scrape into trucks for dealers. For example, we get around Rs 3 per kg for the cardboard scrap we sell. So in a month, we roughly earn about Rs 10,000 which isn’t enough to meet even our bare minimum needs,” Lingamma says. The women say that this year almost all party candidates have visited the slum and have promised them concrete houses if elected to power. “We do not want to live here. We have been asking every political party who visit the place to shift us to a better place. I have a voter ID. But I do not know if I will vote. Back in Kurnool, I used to vote for the TDP. Here, irrespective of the party we vote for, no one can uplift us from this menial job we do,” one of the women says. 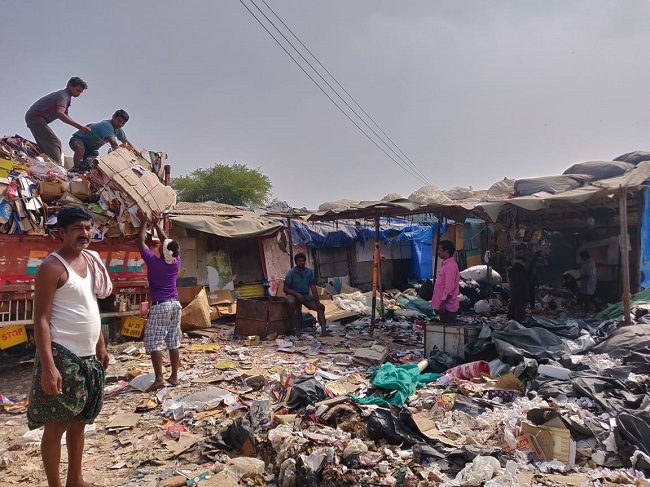 Speaking to TNM, Harichandana, GHMC West Zone Commissioner says that the GHMC has provided ID cards to all the ragpickers in the city and while some of them operate illegally, many have been provided with auto-rickshaws to collect garbage. “We also help them to pay the EMI for the rickshaws. They are also entitled to health cards and ration cards. But many of them are afraid to come into the organised sector citing lack of money and government regulations. Many times we have tried to shut the place down on the grounds of health and sanitation. But it’s a privately owned piece of land and also it’s a question of livelihood versus relocation. There is very little the government can do on this regard,” the commissioner says. Few of the slum dwellers we talked to told TNM that none of the workers there owns a health card, though a few operate on the auto-rickshaws provided by the GHMC. The men and women alike say that they rarely fall ill as 10 years of work has made them immune to sickness. “At the end of the day, the men may gulp down a little alcohol. That is because you can work here if you are only out of your senses,” Ravi Kumar says. Despite adversities, Venkatesh assures that he wouldn’t forget to cast his vote on December 7.